You can’t read far in robotics without encountering the SLAM problem. But what is it exactly? And what are the main approaches to solving it? Today’s paper provides an overview of the SLAM problem, a short history of research in the area, and an overview of the two main methods for solving it. SLAM stands for Simultaneous Localization and Mapping. The challenge is to place a mobile robot at an unknown location in an unknown environment, and have the robot incrementally build a map of the environment and determine its own location within that map. Solving the SLAM problem provides a means to make a robot autonomous. For some outdoor applications, the need for location estimation is eliminated due the availability of high precision differential GPS sensors. SLAM is a process by which a mobile robot can build a map of an environment and at the same time use this map to deduce its location. In SLAM, both the trajectory of the platform and the location of all landmarks are estimated online without the need for any a priori knowledge of location. 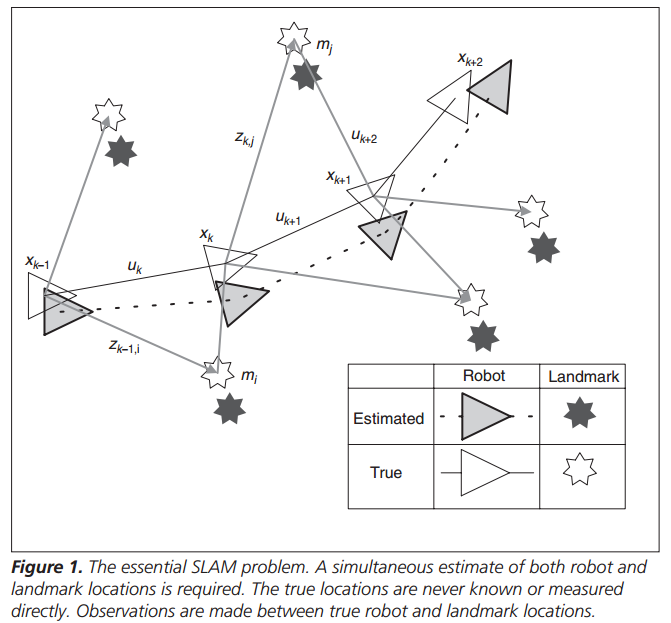 Figure 1 from the paper, reproduced below, shows a mobile robot moving through an environment, taking relative observations of unknown landmarks using a sensor located on the robot. uk, the control vector which was applied at time k-1 to drive the robot to a state xk at time k.
mi, a vector describing the location of the ith landmark. Landmarks are assumed to be stationary (i.e. they don’t move over time). zik, an observation of the ith landmark taken from the robot at time k. Abbreviated to just zk if the specific landmark is not relevant to the discussion. We also build up knowledge of the set m of all landmarks, as well as X, U and Z the history of all robot locations, control inputs, and observations respectively. Suppose we have an estimate for x and m at time k-1: P(xk-1, m | Z0:k-1, U0,k-1). Now we follow a control input uk and make an observation zk. Given this, if we understand the effect of the control input and the observation, we can compute the posterior (estimates of locations at time k) using Bayes theorem. This computation requires that a state transition model and an observation model are defined describing the effect of the control input and observation respectively. The observation model tells us the probability of making an observation zk when the locations of the robot and landmarks are known: P(zk | xk, m). The motion model is described in terms of a probability distribution on state transitions – more simply, the location at time k depends on where we were at time k-1, and the applied control input (note that it does not depend on any of the observations or the map): P(xk | xk-1, uk). This part I just have to take on faith:). The most important insight in SLAM was to realize that the correlations between landmark estimates increase monotonically as more and more observations are made. (These results have only been proved for the linear Gaussian case. Formal proof for the more general probabilistic case remains an open problem.) Practically, this means that knowledge of the relative location of landmarks always improves and never diverges, regardless of robot motion. In probabilistic terms, this means that the joint probability density on all landmarks P(m) becomes monotonically more peaked as more observations are made. 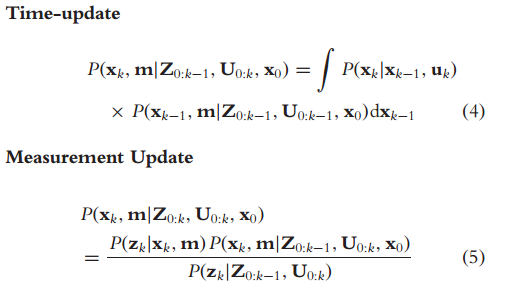 Turning all of this theory into executable algorithms requires finding an appropriate representation for the observation model and motion model that allows efficient and consistent computation of the prior and posterior distributions in the two-step recursive prediction form equations given above. By far, the most common representation is in the form of a state-space model with additive Gaussian noise, leading to the use of the extended Kalman filter (EKF) to solve the SLAM problem. One important alternative representation is to describe the vehicle motion model as a set of samples of a more general non-Gaussian probability distribution. This leads to the use of the Rao-Blackwellized particle filter, or FastSLAM algorithm, to solve the SLAM problem. While EKF-SLAM and FastSLAM are the two most important solution methods, newer alternatives, which offer much potential, have been proposed, including the use of the information-state form. An overview of both of these approaches is given in the paper – reproducing the necessary mathematics here would add little value over simply referring you directly to the appropriate sections on pages 103-106. For EKF-SLAM the motion model is based on a function of vehicle kinematics with added Guassion motion disturbances (fancy way of saying there’s a function than determines how the vehicle will move given its control inputs, with some noise added to account for real word discrepancies). The observation model is based on the ‘geometry of the observation’ (what you think you saw), also with some added noise. This allows you to use the standard statistical EKF method to compute mean and covariance of the posterior distribution. FastSLAM uses particle filtering (the ‘Rao-Blackwell’ bit is a way of reducing the sample space to make it tractable) with each particle defining a different vehicle trajectory hypothesis. The wikipedia page on SLAM is also worth perusing, and if you want to run your own experiments, you can now get started with everything you need using Google’s Project Tango tablet development kit for Android.